← What do you want: Training or Results? Everyone says they have Core Values, even though most people cannot say exactly what they are. Many people want to live by a well-articulated set of Core Values, but struggle with getting just the right ones identified, named or described. Everyone seems to claim honesty and integrity as basic values, but few use these as a measure of their thoughts and behavior when they are conscious of being at an Intersection of Purpose and Now. What is so important that it supersedes all other criteria for your decision-making and behavior? These are your core values, and I don’t believe you can discover or accurately label and describe them by sequestering yourself away with a pen and paper. Pen and paper are necessary, but they must be accessible in daily living; handy when you face a dilemma, a challenge, a problem, a decision of any kind, so you can write down what really is most important to you at the time. 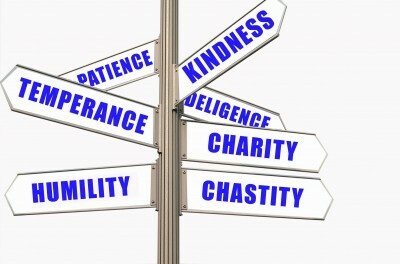 Pick a value, any value – courage, forgiveness, cleanliness, hope . . . – and practice that value for the day. Apply the value at every opportunity and see how it changes the opportunity. See relationships differently, both the close ones and the “drive-by” ones, through this value. Create opportunities to exhibit the value. At the end of the day, ask this question: How did this value play out in my life and work today? The ones that create great answers to this question, the ones that create a story you want to share with others, are most likely to be Core Values. Regardless of what you learn about yourself, you will find just strong is the link between positive values and a wonderful life. This entry was posted in core values, practice, Purpose, values, virtue. Bookmark the permalink.